Garden City, N.Y.: Doubleday & Company,, 1950. 220 pp. ",a.story combining romance and suspense and murder against a realistic Montana background." Carson arrives in Montana to help investigate Emmy and Ann Pardway's involvement in a tragic "accident". 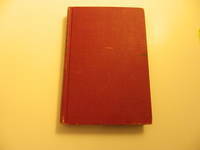 Red hardcover binding has rubs to edges and to top and bottom of spine.Slight bumps to corners. A 1" minor scratch to centre front and a black rub mark near edge. No former owner's name. No corner folds to text. Text is secure and unmarked. Book condition: good.. Book Club (BCE/BOMC). Hard Cover. 8 x 5 1/2. MacMillan, 1970. HC and DJ. 8 x 5 1/4. 149 pp. Mongo has a contract to kill someone. Is he prepared for who it may be? Dj has a grey sticker adhesive mark to top corner and some soiling. Also some scuffing and edgewea r - price clipped, new mylar cover. Back cover is illustration of author coming out of a jail cell. ( This is where the book was written). Red paper on boards binding has a bit of warping from holding and wee bumps to corners- a slight spine tilt. No former owner's name on endpapers. Text is clean and unmarked. Pages have yellowed slightly. Overall cond: good.. Hardcover. Used - Good. N. Y.: Doubleday, 1965. HC and DJ. 8 1/2 x 5 3/4. 188 pp. A routine robbery investigation takes on an unexpected twist when the wife of the main suspect is murdered. Set in Scotland, with a wee taste of the whiskey. DJ has a wee bit of edgewear and a couple of tears, one to top back at spine and one to bottom front at spine. New mylar cover. Book Club Edition is stamped on front flap bottom. Tan cloth on board binding is in nice condition - a bit of an indentation possibly from a fingernail on front. No former owner's name. Endpapers are clean. Text is clean, tight and unmarked. Dj cond: good. Book condition: v. good .. HC and DJ. Good/Good. Toronto: Popular Library, 1955. 128 pp. Lou Bantle, an ex-cop, did time for a crime he didn't commit. When released his town was undercontrol of a vice ring. It was time for him to take action. Original price 35cents. Cover has some creasing, some moisture staining to back but is bright and intact. No former owner's name. Overall condition: good.. Mass Market Paperback. 7 x 4 1/4.